Syracuse Symposium will show “Witkin & Witkin,” Trisha Ziff’s acclaimed documentary about twin artists Joel-Peter and Jerome Witkin, on Nov. 13. They include a mini-residency by photographer Keisha Scarville (Nov. 1-2), a concert by the Society for New Music (Nov. 2), readings by members of the Syracuse Veterans’ Writing Group (Nov. 8) and the screening of a documentary about twin artists Joel-Peter and Jerome Witkin (Nov. 13). A&S recently caught up with organizers Mary Lee Hodgens (MLH), Neva Pilgrim (NP), Ivy Kleinbart (IK) and Roger Hallas (RH) to discuss their respective events. 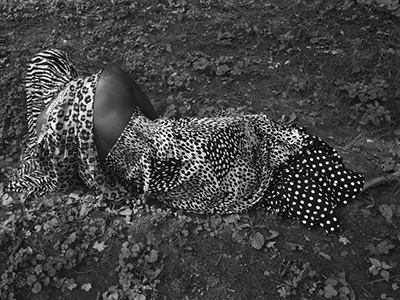 Mary Lee, you are associate director of Light Work, where Keisha Scarville’s photography is on display through Dec. 13. How do you characterize her brand of storytelling? Keisha Scarville’s primary theme is the relationship between transformation and the unknown. Grounded in photography, she works across different media to explore [notions of] place, absence and subjectivity. A selection from “Alma,” Keisha Scarville’s solo show at Light Work. Her new exhibition, “Alma,” refers to her mother, who died in 2015. It features photographs that explore how the loss of such an anchor point can affect one’s identity, as well as one’s sense of absence and self in the world. “Transformation born of loss,” as you have written. Yes. Keisha worked on the project for more than three years and approached it like chapters in a book. There are references to Guyana [South America], where Alma was born, and to Crown Heights in Brooklyn, where Keisha grew up and has continued to call home. She uses Alma’s richly patterned clothing and possessions to conjure up her presence, visually speaking. I sense parallels with your event, Neva, where storytelling can be transforming for performers and audience alike. Our concert draws on the stories of people who fled South Vietnam after the war in search of a better life for themselves and their children. It is called “The Odyssey: Stories of the Boat People,” and shows how these people have held onto their music, art and values. “The Odyssey” is the latest in a long line of concerts that the Society of New Music [which Pilgrim co-founded in 1971] has done at Syracuse. 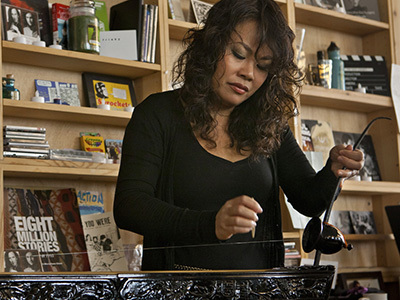 Van-Anh Vanessa Vo performs a Tiny Desk Concert in October 2013. Tell us about the headliner, Vân-Ánh Vanessa VÕ. She is a North Vietnamese musician, composer and filmmaker who has immersed herself in the traditional arts of her homeland. Her story is inspiring, considering that Asian music is male-dominated. She pestered one teacher for three years to give her lessons, until he finally relented and took her on as an apprentice. Vanessa was part of a second wave of Vietnamese refugees who entered the United States in the late Seventies and early Eighties. The similarities between them and the Syrian refugees of today are striking. The Vietnam War also figures in readings by members of the Syracuse Veterans’ Writing Group. Would you say something about the group, Ivy? We have been holding monthly workshops on campus for about eight years. While many of our members are Vietnam veterans, the group is open to all veterans, giving them a safe space to produce and share writing, mostly nonfiction and poetry, with one another. Your event is on the Thursday before Veterans Day. Busy year, right? It marks the 100th anniversary of the end of World War I, the 50th anniversary of the Tet Offensive [of the Vietnam War] and the 15th anniversary of the start of the Iraq War. 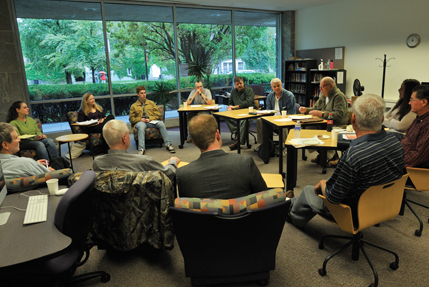 The Syracuse Veterans’ Writing Group meets every month on campus. The theme we’ve chosen for this reading is “Returning from Conflict,” which observes these and other critical moments in history through our readers’ stories of homecoming and reintegration. We will feature seven writers, each representing a unique experience of “Returning from Conflict,” in terms of the physical return from war and the long-term psychic and social process of reintegration. We hope the audience will come away with a deeper, more nuanced understanding of the diversity of veterans’ experiences and the true costs of war. You and your co-leader, Professor Eileen Schell, have remarked about the literary quality of your members’ writing. We think audiences will be surprised by how powerful and piercing these stories are. The work featured in this reading is at times bold, witty and humorous; at times poignant, lyrical and reflective. But all of these writers are fearless in confronting the military’s impact on their lives. Roger, you and Professor Tula Goenka, as co-directors of the Syracuse University Human Rights Film Festival, bring many filmmakers to campus. What is special about this event? 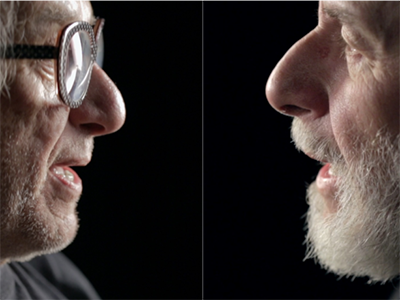 We are thrilled to present “Witkin & Witkin,” Trisha Ziff’s superb, new documentary about painter Jerome Witkin [professor emeritus in the College of Visual and Performing Arts] and his identical twin brother, photographer Joel-Peter Witkin. It was Trisha’s first visit to campus in 2012 to screen her film “The Mexican Suitcase” at the Syracuse University Human Rights Film Festival that sparked the idea for “Witkin & Witkin.” A good friend of Joel-Peter, she was eager to meet his brother, Jerome. That initial meeting set the stage for a documentary about the two brothers, who may share genes and a family history, but remain both personally and professionally divided. 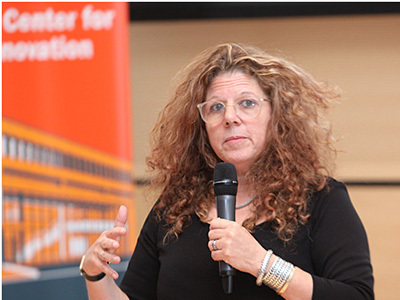 Trisha Ziff at Syracuse in 2016. Will we hear from the filmmaker or the artists? We will host Trisha and Jerome, both of whom will introduce the screening and participate in a Q&A afterward. Trisha is a photography curator-turned-filmmaker who has a gift for reframing the rich storytelling of static images within the dynamism of cinematic storytelling. Jerome is a world-renowned painter and beloved professor who has trained generations of artists at Syracuse. All of us seem to enjoy a good story. NP: Storytelling is a great tool. If used properly, technology can enhance it. For instance, “The Odyssey” features video clips of brave Vietnamese who, in their own words, talk about risking everything for a better life in the United States. We see how they have carved out new identities for themselves while remaining true to their heritage.IK: For audiences, storytelling offers access to otherwise incomprehensible experiences. It can change people’s way of understanding the world, providing a broader perspective and challenging distortions in thinking. For the writer, the act of translating experience into language, working to ‘get it right’ on the page, can be an enormous help with coming to terms with a complicated past. RH: Images tell stories differently than words, but different kinds of images have their own distinct modes of storytelling. [To Hallas] Would you elaborate? RH: A painting or photograph tells a story within a single frame, giving the viewer time to contemplate what it is saying. Cinema, on the other hand, controls our experience of narrative time, as it unfolds across the duration of a film. In my own research, I have been thinking about what happens when these two distinct modes of visual storytelling intersect in innovative ways, which is another reason why I am excited to bring “Witkin & Witkin” to campus. MLH: Storytelling is how we share our humanity. It may be the primary antidote to the isolation and loneliness of modern life. For more information about the 2018-19 Syracuse Symposium, visit humcenter.syr.edu.